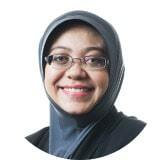 Nazatul Fida is a Partner with the firm’s Real Estate Practice Group based in the Kuala Lumpur office. Nazatul Fida advises domestic and international clients in the acquisitions and disposals, leasing, tenancies, tender, property development and Waqf (an endowment made by a Muslim to religious, educational or charitable cause) of all types of real estate. She also advises clients on broad range of banking documentation relating to the financing of purchase of property, refinancing of property and also on other general conveyancing practices.